Use rubrics to help you provide detailed and meaningful grades and feedback. A rubric is a scoring guide used to indicate activity expectations, possible performance outcomes, and the scores associated with them. You can create rubrics using the activity editor in the Editor or using the Clipboard. This article outlines both approaches. Select or create the activity for which you want to build the rubric and click the pencil (edit) icon. Note: You can only create rubrics for activities that are manually graded. This means that they cannot be applied to an entire assessment and practice question activity, but they can be used for individual essay questions within those activities. 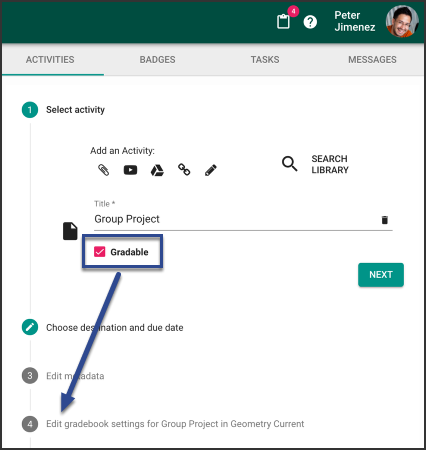 On the Gradebook settings card, select Rubric from the Score entry dropdown. Click Add rubric underneath the dropdown. Select a rubric template from the dropdown and click Next, or choose <empty> from the dropdown and click Add to build a rubric from scratch. Remove criteria by clicking the x that appears to the right of each. Provide the maximum criteria composite score in the Max field. This value is automatically distributed evenly between the existing levels in the criteria and populates the Points fields and level headers within the criteria. You can edit the Points fields if you don't want the value distributed evenly, but you must do so after entering the Max value. Create a Clipboard activity using these instructions; check the Gradable box to enable the 4 Edit gradebook settings for... step. 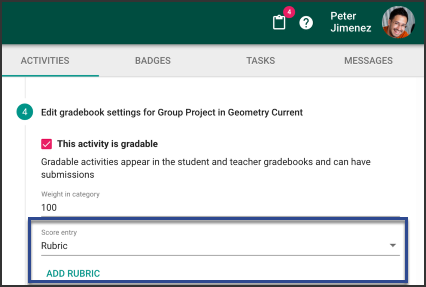 On step 4 Edit gradebook settings for..., select Rubric in the Score Entry dropdown. Click Add rubric, give it a name, and follow the directions below. 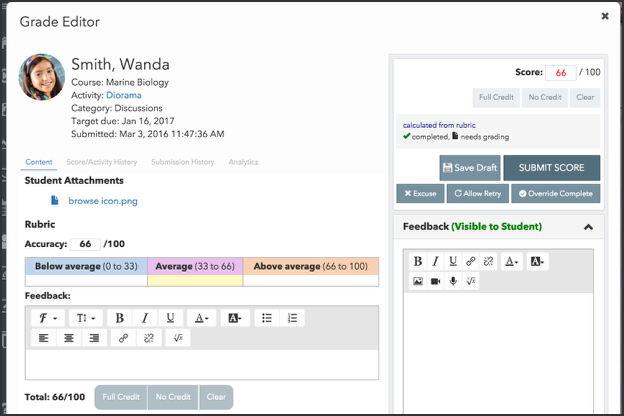 Open the activity you want to grade using the Grade Editor. The rubric you created appears under the Content tab. For each criteria, click the description that best matches the student's performance. Click Leave Feedback below each dimension for which you want to provide feedback. 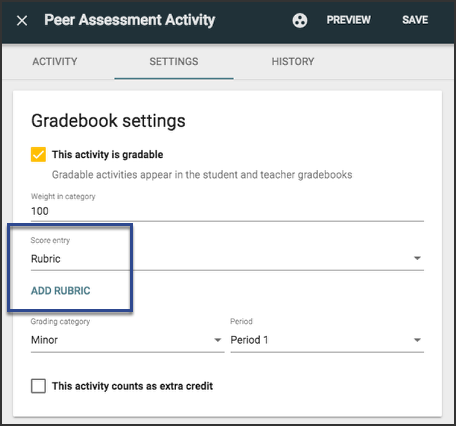 You can only create rubrics for activities that are manually graded. This means that they cannot be applied to an entire assessment and practice question activity, but they can be used for individual essay questions within those activities. This rubric is highly improved from the last version, especially in regards to grading,but I feel a key point has been missed. After a rubric has been created it needs to be saved as a template and able to be imported into any other activity the teacher would like. Teachers use the same rubrics for many different activities. For example an ELA teacher uses one rubric for research/book reports. They do not want to have to re-create that rubric each and every time they create an assignment. Even better, allow domain level rubrics that could be used as templates across a district or school! Great feedback, Kevin. As stated in the release notes, this was our first update for rubrics. We have several more enhancements that will be rolling out over a period which I believe you will quite like. I really like some of the changes to the rubric. It made my day when I saw I was able to use a rubric template for multiple assignments. One issue that I have noticed is that the new rubric takes up a lot more screen space in the activity grader. This makes it very difficult to look at an assignment and apply points to the rubric as I look at it. Thank you for your feedback Kevin, it'll be passed along to our Product Team for consideration on if it can be modified to allow more visibility of the assignment. I would love if standards could be attached to different columns in the rubric. Currently, a rubric cannot affect students' mastery levels. Sadly, this is a PBL killer. Is this apart of your future plans? Eric, we don't have any ETA regarding attaching standards to specific columns in a rubric. We appreciate the feedback on features that help improve the teaching/learning experience. We are exploring using Rubrics in our district. Here's a quandary we came upon and I can't find a good way to do this with 'already created rubrics' when it comes to wanting to use them with 'essay' type questions in the ASSESSMENT activity. 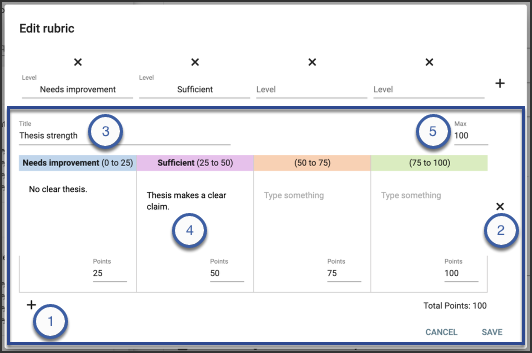 Currently, staff can 'add' a domain level rubric to an ASSIGNMENT they create no problem. When we get to the Assessments, we see that rubrics can be added to an Essay type question but there's no choice to pick from the 'district' level rubrics at the domain level. I recorded the short video below (2 mins) explaining what we're trying to do. Any thoughts on this? When using a rubric to grade work, the feedback entered is not visible to the teacher after the assignment is submitted. Is there somewhere I'm not clicking?